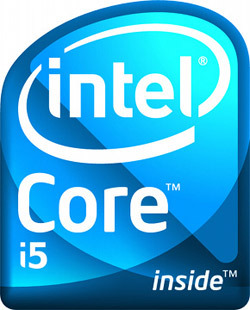 In a matter of weeks Intel will unveil a new CPU architecture called the Core i5 processor. This chip includes a built-in memory controller much like the Core i7 and AMD Athlon 64 CPUs before it, but breaks new ground by taking over many of the functions previously relegated to a PC's main core logic chipset. The CPU-Northbridge-Southbridge architecture happily survived many years of upgrading intact, with the occasional bandwidth bottleneck here and there. Now the wolf is knocking at the door and one of these little piggies is about to get eaten. What was once a three chip system will be simplified to just two parts with Intel's upcoming 'Lynnfield' P55 platform: CPU-Southbridge. In the past couple years Northbridge chipsets for the Intel platform have included the 945P, 965P, 975X, P35, P45 and so on. Common to each generation was a discrete silicon chip, and of course, each time some aspect of the technology advanced an new generation of chipset and motherboard emerged. This is partly because it's good business to make existing technologies obsolete, and because a Northbridge chipset acts as bridge between the CPU, system memory, graphics card and the rest of the PC. Without it the PC cannot function, and for reasons beyond the scope of this article core logic chipsets cannot be upgraded like processors. The third member of the family (the first being the CPU) is called the Southbridge. It's job is to bridge the CPU-Northbridge with the rest of the computer; input/output devices like the hard drive, PCI/PCI Express expansion slots, sound card, network controller and even mouse/keyboard. On the Intel platform these have included the ICH7, ICH8, ICH9 and ICH10 Southbridge chipsets. 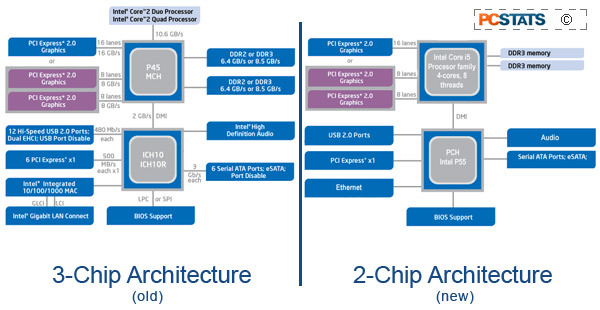 Here's a block diagram to illustrate the relationship between these three critical chips in a simplified computer system, the way it has been and the way it will shortly become with the Intel P55 platform. The main difference between the two is that tasks previously handed by the Northbridge chipset have been rolled into the Core i5 processor. So once again, everything you know about computers is about to be stood on its head and change. Once Intel's new 'Lynnfield' P55 Express motherboards start hitting the shops this fall, there will be an extra layer of future proofing to consider, with pros and cons to each path. As PCSTATS has literally tested hundreds of motherboards in the past 10 years, we have to wonder what impact the Intel Core i5 processor and P55 Express chipset will have in an industry where differentiating boards is already a difficult task for manufacturers. I suspect build quality and custom features will move to the forefront, as Gigabyte has done with the GA-P55-UD5 board. From its special 6-layer PCB with 2oz. copper substrate, to the Japanese made solid state capacitors and electrical components, the energy saving features built into it, Gigabyte is certainly pulling out all the stops. We're excited to see just what the Gigabyte GA-P55-UD5 motherboard is capable of with a Core i5 chip locked into its 1156-pin socket.... but sadly, under pain of death I cannot share ANY benchmarks, numbers or performance related results dear reader. Instead, PCSTATS offers up a fun preview of what to expect from the new crop of Intel P55 based motherboards, the Intel 'Lynnfield' platform, socket 1156, and everything Gigabyte has squeezed in between. Gigabyte's GA-P55-UD5 motherboard is just one of five socket 1156 Core i5 boards set for the initial launch, it represents the makers' flagship model. Along with the obvious support of Intel Lynnfield socket 1156 processors, the GA-P55-UD5 motherboard features one PCI Express 2.0 x16 videocard slot and two PCI Express x8 slots (which look like PCIe x16), two PCI Express x1 and two PCI slots for additional expansion options. 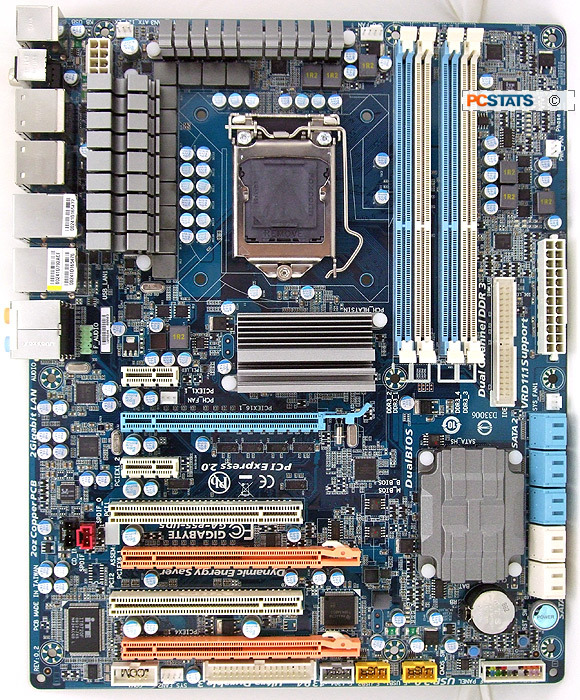 The board has four dual channel DDR3-1333/1066/800 memory slots which can accommodate up to 6GB of DDR3 RAM. Memory can be overclocked to run at DDR3-2000+ speeds with compatible modules. In terms of data storage the GA-P55-UD5 motherboard is well equipped - there are no less than four 6Gb/s SATA II and six 3Gb/s SATA connectors! Pair that up with two eSATA jacks on the back and RAID 0,1,5,10, and the board can host some seriously large hard drive or solid state drive arrays. Rounding out the features on the GA-P55-UD5 board are (14) USB2.0 ports, (3) Firewire and a pair of Gigabit network jacks. High Definition 8-channel audio comes standard as does support for multi-videocard gaming options like ATI CrossfireX and nVidia SLI. NVidia is basically finished in the chipset business whether it likes it or not, so without broad support by other chipset makers for its multi-videocard technology, SLI would quickly become useless. Gigabyte has put much effort into energy efficient features, and in testing PCSTATS has seen positive although small results from its Dynamic Energy Saver tools. The board uses a 24-phase power supply and special Japanese made capacitors and MOSFETs to (theoretically) improve its longevity - generally known as 'Ultra Durable 3' by the manufacturer.